The mindboggling Onam festival gives every Malayalee the opportunity to relish savory delicacies and knowing this well, TheHolidaySpot intends to enhance the pleasure of your tastebuds with some traditional Onam recipes. If you happen to be a Keralite(and even if you are not), we are sure you would enjoy these mouthwatering foodmaking ideas and use them to cook up delicious Onam dishes for yourself and your loved ones. If you want to share these fabulous Onam recipes to your friends and close ones, please click here to forward them this page for their benefit. Wish you a lip-smacking Onam celebration! Check out these tasty Onam recipes and add more spice to your celebrations. 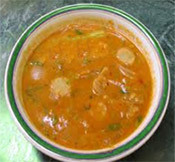 1) Sambar dal (red gram dal) - 2 cup. 3) Fenugreek seeds - 1/4 teaspoon. 4) Red chillies - 3-4. 5) Green chillies - 3-4. 6) Sambhar powder - 1 teaspoon. 10) Mustard - 2 teaspoon. 11) Tamarind paste - 1/4 teaspoon. 12) Cooking oil - 4 tablespoons. 1) Wash the vegetables. Dice them into long pieces. 2) Pour 3 cups of water into a bowl and cook the sambhar dal in it. Add turmeric powder and salt. 3) Filter out the water to get only the cooked dal. Keep the dal aside. 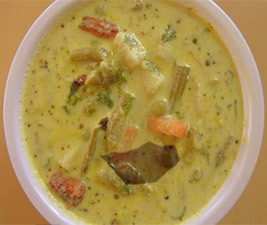 4) Cook all the vegetables in the water you have prepared the dal in. 5) After the vegetables have been cooked, add in the tamarind paste. 6) Add in the cooked dal and simmer for 1-10 minutes more. 7) In a large pan, splutter mustard in some oil. Toss in methi, red chillies, green chillies, curry leaves, hing, turmeric, and sambhar powder. Fry all the items for a few minutes. 8) Season the sambhar with the above preparation. 9) Sprinkle coriander on top to garnish. 1) 3/4 kg Vegetables (consisting of drumsticks, brinjals, yam, string beans, raw banana, ash gourd, ridge gourd). 2) Tamarind paste - 1 tbsp. 3) Turmeric powder - 1/2 tsp. 4) Red chilli powder - 1/2 tsp. 5) Green chillies - 6 to 8. 6) Grated coconut - 1 Cup. 7) Oil - 2 tbsp. 8) Curry leaves - 5 to 6. 9) Water - 4 cups. 10) A ladle, a small frying pan and a skillet. 1) Wash all the vegetables, peel and dice into cubic pieces. 2) Cook the drum sticks seperately with salt for a few minutes. 3) Grind the grated coconut into a fine paste. 4) Pour the water into a skillet and bring to a boil. Toss in the cubed vegetable bits. 5) Add in red chilli and turmeric powder. Mix them well with the vegetable using a ladle. 6) Now cook the vegetables well. 7) Toss in green chillies, tamarind paste, salt and coconut paste. Stir with a ladle to mix these properly with the vegetables. Turn down the oven temperature to LOW and cook for 10-15 minutes. 8) Heat oil in a small pan. Add in the curry leaves and fry until the leaves change color. 9) Now add the cooked vegetables and fry for sometime. Take off from heat, garnish and serve. 1) Ash gourd - 100gm, diced into small pieces. 2) Pumpkin - 100gm, diced into small pieces. 3) Green chillies - 4, split at the edge. 6) Coconut milk - 1/4cup. 8) Coconut oil - 1 tablespoon. 9) Curry leaves - 1sprig. 1) Squeeze out a little more than 1 cup of the milk from the coconut you have. 2) Grate the coconut into small pieces. 3) Peel the upper layer of the ash gourd and pumpkin. Dice these into small pieces. 4) Pour water into a medium bowl. Add in the vegetables and red gram dal. Cook. 5) Throw in the green chillies and sprinkle enough salt. 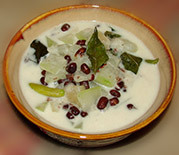 6) When you have finshed cooking, add about 1 cup coconut milk to the preparation and bring to a boil. When the mixture becomes thick, add the remaining coconut milk and boil again for a little time. Take off from heat. 7) Add the coconut oil and the curry leaves. Mix well with a ladle. Serve hot.